The Siskiyous and the Wallowa Mountains are geologically the two most ancient ranges in Oregon, with the Siskiyous being part of the so-called "Klamath Knot" written about by David Rains Wallace. 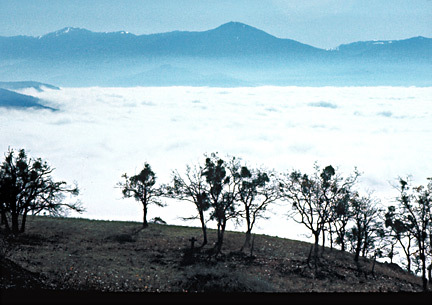 Both areas have unique soil types, and are biologically exceptionally rich in diversified flora and fauna; note the prominent oak tree in the image above, thriving on a sunny slope at 4,200 ft.. The Medford area is unique, possessing the vegetation types and climate more charateristic of California than of the rest of Oregon; it is a type of climate termed "Mediterranean" -- cool, rainy winters and hot, dry and very sunny summers... The image to the left is an extremely historic trail sign declaring "Crater National Forest," which dates this humble sign to 1932 or earlier! The Crater NF was established in 1908, and was renamed in 1932 into the modern "Rogue River National Forest." The destination of "Ashland Peak" refers to the modern "Mt. Ashland," as in my image above. I like to imagine the view off the Mt. Wagner Lookout in those pre-1932 times! Mt. Wagner lookout was located at the summit of 7,200 ft. Wagner Butte, which is the pointy mountain in the center of the image. The first permanent lookout structure went up in 1923, while 1971 saw the destruction of the mountain's final lookout structure.... In the 1960s, Wagner was a rigorous hike on a old trail that was something of a challenge to follow. It's summit was a spectacular vantage point by daylight, but at night my high school friends and I managed to scare ourselves silly with readings from Edgar Alan Poe! The lookout has been torn down and defunct for several decades. Click here for a hiking story which takes place at a lake reached by hiking nine miles SE along the ridge from which this picture was taken. Mt Ashland has for many years been home of Oregon's southernmost Ski area, simply called Mt. Ashland Ski Area. It's where this photographer first experimented with downhill skiing, borrowing his brother's Head skis. Of course, his new Konica 35mm SLR camera came along, and took these pictures .... If one turns and faces northwest from this spot on a day without fog, they can also see one of the Rogue Valley's well-known landmarks-- Upper and Lower "Table Rock," which are prominent dry mesas lying a mile north of the Roger River...... Oregon's other major ski areas lie far to the north of the Siskiyous (Timberline Ski Area, Mt. Bachelor Ski Area, Mt. Hood Meadows).... a lesser-known area, Anthony Lakes Ski Area, lies in the Blue Mountains of NE Oregon, very far to the east of the Cascade Mountains--- like Mt. Ashland, Anthony Lakes is far from any major urban area; also like Mt. Ashland, it's base elevation is very high (7,100 ft), even higher than Mt. Ashland's base (6,380 ft.). It's hard to imagine from up here in the brillant sky, but it's another bitterly dank and dark foggy day all over the populated areas of the Rogue Valley, Medford, Ashland, and Northern California. This kind of day made it difficult for the Young Photographer to want to rejoin his family in their dim Valley Home. He began to long to stay high in the mountains and leave behind his youth. Mt Shasta, one of the great giants of the Cascade Range, beckons impressively in the distance, some 55 miles away. The photographer was to attain its rarified peak 3 years later, after suffering mightily with his first bout of altitude sickness--- take a look on the "Meet your Photographer" page, near the bottom, and you'll see him, outwardly jubilant, but inwardly Dueling with a headache and incipient nausea as he gropes his way across a field of Neve' Penitente snow spikes. Our goal was to visit a place not shown on any map and make it ours. My high school friends John and Greg and I poured over our USGS topo maps, and found a small lake in the mountains east of Medford. We decided then and there, "This is it!" Maybe we missed the irony of our method, but truly, in this modern era of aerial and satellite mapping, a place like a lake, however small, isn't going to escape the mapmakers pen, and if it is year-round water and even 1/4 mile long, it will have a name.... But our chosen lake at least had no road or trail leading to it... And it lay in the bottom of a deep canyon which was heavily forested, which suited our imaginations well because it meant that the only way to its unknown shores was via bushwacking up or down the steep canyon. After a dusty ride, John's parents dropped us off in the headwaters area about 1,200 ft. above the lake. We figured it was about 3 miles down to our target. After a pleasant meadow, we entered a steepening canyon with dense vegetation, and soon our frame packs proved to be highly annoying as they repeatedly snagged on the vine maple and understory trees, but we persisted downward, youthful and strong. We had been planning a week-long backpack in the High Cascades, but it was still snowed-in up there at over 6,000 ft, so we thought we'd warm up for The Big One by hiking to this 3,600 ft. high place in the lower regions of the Cascades. In mid-afternoon, covered with sweat and scratches, we stumbled out onto the lake shore. We had found it! Our eyes took in a dim scene, still, quiet, seemingly a Lost World. Our high school English class had forced us to read "Lord of the Flies," and now, suddenly, WE were them! Civilization was vanished and was no more. We were alone for three days to create and destroy, and that we did with a vengeance. A modest stream entered the lake, and there at virtually the only flat spot along the entire lakeshore, we set up camp and campfire. The stream had created a small delta of pebbles and gravel, which was one of the few places open enough to the sky that we could warm ourselves with sunshine for a few hours each day. After a quiet night, morning found us spread all over the delta. We began to imagine a mighty dam. We had no drills or bulldozers, only our adolescent strength, but by noontime all manner of levers and pry bars littered the delta as we strained and rolled and pushed any heavy object we could find, mostly stones and dead trees from along the shore. Timber-falling beckoned to us, but with only a hacket, it defied our abilities. Not that we didn't try. By the second day of hard labor, our dam was leaking in dozens of places, but had created a pond some 20 inches deep and 12 feet long. By the third day we had pushed waters 30 feet upstream behind a 3 feet high dam by the use of many more big rocks and much caulking. We had paused that afternoon from our labors. It was quiet at the lake once more, and our arguments about construction details seemed at peace. A sense that our time at No Name Lake was nearly over laid upon us. I was opening a package of cheese when without warning one of our largest boulders fell off the dam. Swiftly our hard-won waters began to pour out through the gap. Before we could even get to the break, two more of our larger rocks had also been pushed aside. We stood in the chilly water above the dam as the creek rapidly carved its way nearly back to base level. For a few moments, we seemed poised at a choice. We could scream in anger, or we could joyously cheer the rushing waters. We cheered. We gave the lake back to itself and departed, reaching our pick-up point in near-darkness. Factual Details: first, a note of caution-- parts of this journey may be on private land; I did not have a current Rogue River National Forest map on hand with which to check this out (in recent decades government agencies have done a lot of land trading and so an old map or a USGS topo will not answer the question of private vs. public). The Lake in my story is Lost Lake, elev. 3,590, and it is on Lost Creek! The lake is 1/4 mile long and fairly skinny. The nearest road is a very primitive one that deadends about 230 vertical ft. above the lake's NW shore (then you get to bushwack down to the lake, and then bushwack clean around the lake trying to find a flat spot to camp).... 0.9 miles upstream at 4,060 ft are a nice falls. Lost Creek's headwaters lie along the high country just east of Grizzly, the peak of which is 5,920 ft. This high country has many minor peaks just above 5,000 ft.... 3.5 miles to the SW by air is the old Shale City mine (4,480 ft), which actually is on the opposite side of the watershed divide from Lost Creek..... The peak of Grizzly is 4.3 air miles from Lost Lake. Upstream, go past the falls, take the SW branch and keep going, at about 2.3 miles from the lake, you reach a nice meadow at 4,540 ft. Go upstream from there about another 0.6 miles and you reach a more major dirt road at 4,840 ft, which is really right at the headwaters of this branch of Lost Creek.... This is probably where we got dropped off for our hike by John's parents. (2.9 miles downhill to the lake, an average drop of 430 ft. per mile). The total length of Lost Creek is therefore only about 8.5 miles. Note: there are many little lakes about 3.6 miles south of Lost Lake; they are smaller than Lost Lake and truly are unnamed. 4WD primitive roads snake thru them; elevations are about 4,600 to 4,975 ft. The ridge above them rises to a max. of 5,450 ft, and there is a more major dirt road along the ridgetop..... None of these lakes have outlet streams, but they are more or less on the headwaters of Babe Creek, with Ice House Lake at 3,800 ft being 1.6 river miles downstream from the lakes. Babe Creek becomes Frog Creek, which then empties into Walker Creek at 2,200 ft., then it is only 0.9 miles to paved road at 2,080 ft. beside the creek. Then go another 1.9 miles downstream and meet the junction of big Emigrant Creek and the Ashland Municipal Airport, Sumner Parker Field at 1,860 ft, and you are truly now in the Rogue River Valley lowlands! Link to my story "Old Trail"